That was the motto of the staff at Chanterelle, and it applies around here as well. We get asked about food a lot when it comes to the boat. I think some people don’t realize that we do, in fact, have an oven, stove, running water and refrigeration. It’s possible that some people don’t realize we’ll be within dinghy range of restaurants and shops for most of our trip. For sure, most people who ask us about food know that I used to cook for a living. It’s a mess. I don’t want to talk about it. Thinking about stocking up. We have a friend who, in preparation for cruising, spent over a week eating nothing but canned food. We can do better. Food is everywhere, and we plan to take advantage of what’s local. We have, however, spent some time thinking about some items to stock up on–heavy stuff that we don’t want to carry back from the store so often (flour, olive oil, tetra-pack chicken stock, canned tomatoes); long-term storage items that are cheap and easy to buy now (rice, dried beans, box-o-wine); things that are expensive or hard to find along the way (maple syrup, maple syrup, maple syrup). Thinking about ways of cooking. We have an Origo (non-pressurized) alcohol stove, which we frankly love and will discuss later at length, I’m sure; but it’s true that using it heats up the boat and uses lots of fuel. We’re learning to use the pressure cooker, even though it still terrifies me a little bit, to cut down on cooking times–especially for the beans. We’re considering a grilling plan; the boat came with a charcoal grill that clamps to the stern rail, but will that be practical? And how about a solar oven? I can absolutely picture throwing something together in the late morning, going for a hike, and coming back to a solar-cooked dinner! Thinking about what to bring from our kitchen. Will my favorite baking dish fit in the oven? Will it break after a month? Will the beautifully-seasoned cast iron skillet rust away to nothing? How about the steel wok? 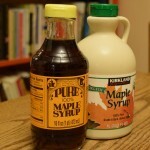 We have about a thousand Mason jars–can we use some of them for storage? Different people have different answers to these questions; we’ll have to see what works for us. Except the baking dish. Turns out, it fits, so it’s coming. Sorting through recipes. So. Many. Cookbooks. Obviously, very few will make the cut. So, I’m waltzing through a book a day, trying to cull recipes that will make sense for our boat life. Emphasis: fish; desserts that don’t require a mixer; things that cook in one pot. Meanwhile, the actual cooking around here is suffering. I’d rather not discuss what’s on the stove right now–it’s not something I’d serve to anyone who wasn’t family. Time to temper your expectations, everyone; the moment for homemade duck confit is coming to an end. 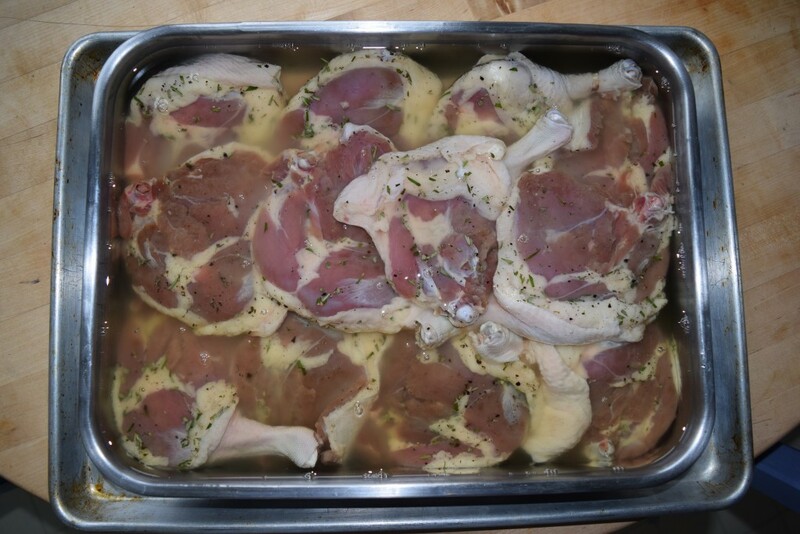 Duck confit, ready to go in the oven. 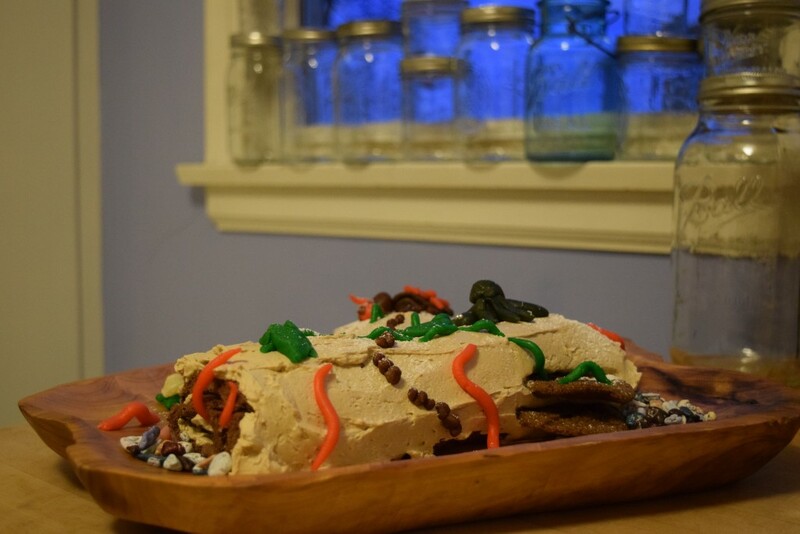 Annual buche de noel, this year featuring a battle of worms versus ants; the black thing on top is a spider. Also will not be replicated on the boat. We’d been advised by more than one smart person to wait until the last possible moment to purchase our boat. Jim Trefethan, in his book The Cruising Life, particularly warns against buying a cruising boat too early; the costs of storage alone can knock significant time off your cruise. 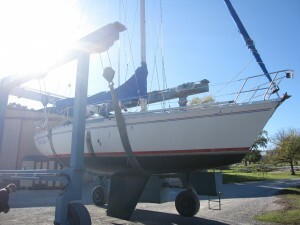 The boat in Texas, hoping we would buy her. There are plusses and minuses on both sides of the argument. In delaying your purchase, you miss out on all the costs of storage, haul out (for those of us in cold climates), dock fees. If you arrive at your boat right before departure, you’re more likely to only upgrade the items you think to be vital, instead of tinkering around with switching out all the cabin lights to LED and feeling like you must have a new inclinometer before you even think about pushing off. You can spend your inherent savings to get a better, more cruise-ready boat. The other way to go: buy your boat in advance, and take on the fixer-upper. 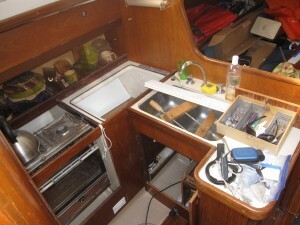 Spend less money initially, and get the boat more how you want it. Spend the time to search out sales and comb through eBay. Do all the work yourself. Get familiar with sailing the boat before you depart. It’s hard to estimate how much additional money our boat has cost because of our decision to purchase two and a half years in advance. Oconto storage, lift-in and haul-out, and jack stand rental cost us about $900 a year for two years; this winter, we’re paying about $1000. We paid one summer of slip rental at a fancy marina that first year for $1200. Insurance, diesel, pump-out fees–those costs are unambiguous. Would we have gone LiPo on the batteries if we were in a last-minute rush to go cruising? No way; but how much more did that cost, for doubling both our usable power capacity and the life of our new batteries? Hard to say. There is NO DOUBT we are adding on things that are not required for cruising, as we sit out this last long winter making plans; a certain expensive fishing reel comes to mind. 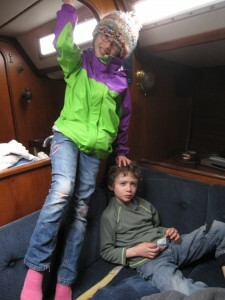 But there’s one thing that the last-minute purchasers miss that we think has been invaluable to us: our kids love the boat. We were all about the positive association game that first summer. The boat, in their mind, was synonymous with the marina pool, family movie nights and donuts. They know that won’t be so much the case going forward, but in their little reptilian brains, when you mention “the boat”, their pleasure-centers light up, even if they don’t know why. (Bribery and manipulation–the keys to all successful parenting!) Getting the boat early, and letting F and T become familiar with the space, has given them less fear of the many upcoming unknowns about this trip. Truth be told, the same logic applies to the parents. Michu has explored every nook and cranny of the boat at this point, and more often than not replaced whatever wire or piece of hose he’s run across. He knows more about the electrical systems and engine that he’d really like. We both understand navigation better than we did two years ago, and are actually able to fall asleep while at anchor, instead of being terrified of dragging onto the rocks. It’s been confidence-boosting all around, and we’re all a little less terrified moving forward. Getting ready for passport photos at the post office. I guess this year, there’s expected to be a run on passports: people are concerned about Real I.D. laws, even though they don’t take effect until 2018; passports issued when they were first required for entering Canada or Mexico from the US are expiring; and more countries are requiring that passports not expire for at least six months from your expected departure before letting you in. The perfect storm. We applied early; one more duck in the row. 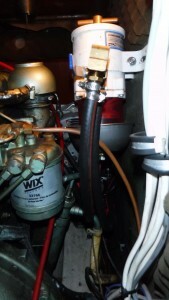 Engine Part 1 – Water should stay outside, fuel should stay inside. As promised, here is the first installment of the engine series. Back in Electricity Part 1, I explained how, at the time of purchase, the batteries aboard Milou were trying to light themselves on fire. 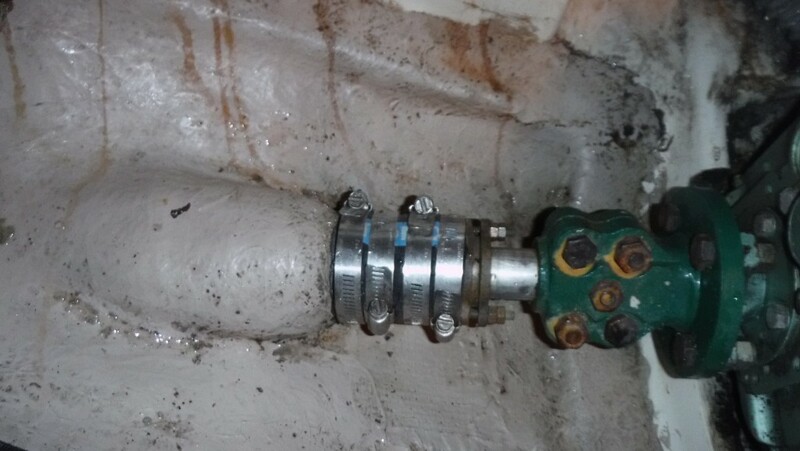 The other two strikes against the boat at the time of purchase were: the stuffing box was severely corroded and was leaking at an alarming rate; and the hoses supplying diesel fuel to the motor were also leaking badly. Leaking stuffing box = water entering boat (read: sinking). Leaking fuel hoses = bad diesel smell, pollution (when the bilge pump dumps it in the lake) and, I suppose, a fire hazard as well. I’m not sure what the previous owners had done (or not done) to her, but when I met Milou she was bleeding diesel while trying to sink and light herself on fire. An unhappy boat to be sure. Moving forward with Milou, I decided to set some priorities. Priority number one: Do not catch on fire. (This was primarily addressed early on in the Electricity Series). Priority number two: Do not sink. There are so many things not right here. Believe it or not, what you see in this picture kept me from buying the boat–that is, until Deb made me do it. The picture shows the back of the motor, or more precisely the transmission (the thing painted green). Moving aft from the transmission is a ball of rust called the coupler; this attaches the transmission to the propeller shaft (you are right, it probably should not be so rusty). The propeller shaft is that little piece that is more brown, between the rust and the corroded green silicon bronze of the stuffing box. Yes, the prop shaft is made of stainless steel and should be a shiny silver metal color. The job of the stuffing box (the corroded light green thing with 2 bolts pointing toward the ball of rust) is to let the prop shaft spin but not let in too much water, ideally a drop or two a minute, when the shaft is spinning. It requires some maintenance. The bolts have to be tightened as the packing material (this used to be oiled flax, but is now Gore-Tex) wears. If the engine is not properly aligned the shaft will “egg” out the packing, making it leak more. Moving aft, it is nice to see that the hose which attaches the stern tube to the stuffing box is double hose-clamped at both ends. Of course, the aft-most hose clamps were so corroded that they snapped as I tried to loosen them; and in the forward-most clamp, the screw was made of inferior “stainless steel” and was rusted away to almost nothing. The thing in this picture keeping the boat from sinking (more quickly, it was leaking pretty good at the time of inspection) is the fact that the 30-year-old hose had shrunk and stuck to both the stern tube and the stuffing box. The hose itself was about 1/8 of an inch thick, and when I pushed hard with my finger, it delaminated and tore. I waited to try that until the Milou was out of the water, because I didn’t want to be stuck like the little dutch boy. Much better. This picture is from three days ago. The new rust on the coupler bolts is from water that is coming in from a leaking lazarette. Yep, I need to seal that up – don’t worry, it’s on a list. When I pulled all of this apart to replace the hose (the one that I put a hole in with my finger), one of the threaded studs used to adjust the stuffing box was so corroded that it could not be removed intact. Believe it or not, finding a metric threaded stud made of silicon bronze is not easy. Our friend Kyle has a PhD in metal and has a small metal lathe in his basement. He let me borrow both the lathe and his brain as he walked me though how exactly to fabricate the needed part from a piece of stock silicon bronze. Yes, it was easier to machine the part from scratch than to find and purchase one on the world wide web. When we bought the boat, the 30-year-old stainless steel braided hose that led from the fuel tank to the secondary fuel filter was leaking at an alarming rate . I estimate it leaked about one to two gallons an hour. Amazingly, the previous owners did not notice that their fuel use had tripled; nor that, when the bilge pumped kicked on after every half hour of engine run time, there was a rainbow sheen of diesel on water. To be fair, considering the water leak (remember the sinking!) the pump was probably running nearly constantly, and the diesel may have been very diluted. 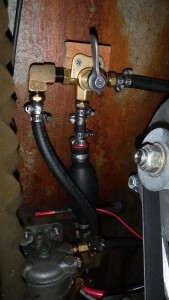 The easiest way for me to fix the leaking diesel would be to simply replace the hose. I have lots of little diagrams like this in my Big Book of Lists. 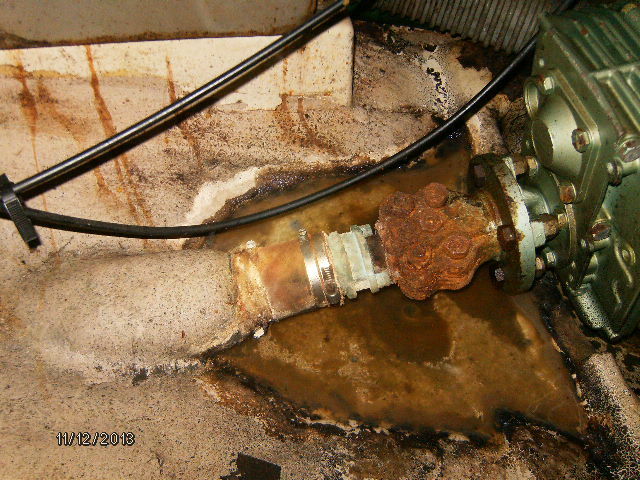 The leaking hose led to a CAV filter, which doesn’t really have a filter medium in it. The CAV sets up a spinning whirlpool of diesel fuel which throws water and heavier-than-diesel gunk out to the walls of the bowl, where it slides down to the bottom and waits to be drained out. The problems with the CAV are first, that it is not see-through, so you have no idea when it is totally full and about to send the bad stuff (water, algae, junk) into the motor; and second, the lack of an actual paper filter. If it had a filter, the filter would plug up before the bad stuff got to the motor. This would stop the motor (no fuel), but at least I wouldn’t have to tear down and rebuild the entire fuel system. Well, the CAV doesn’t have a filter, but there is a filter the motor itself–the so-called primary filter; it is there to save you when the CAV gets overwhelmed. Looking forward (I am straddling the coupler), WIX is the primary filter and Racor, secondary filter, is the white cylinder with the see-through bowl full of red diesel fuel. I have this idea/fear that just when we need the motor most, a big chunk of goober will clog the primary filter, and we will be stalled until we can find a calm place to stop and change the filter and bleed the air out of the fuel system. I bought a very beefy Racor (500 turbine) fuel filter that has a paper element plus the whirlpool system plus a see-through bowl. So, fuel-wise, I can see when things are getting bad. But still, if the big goober hit the Racor we would be in the same situation; so I plumbed in a three-way valve and a shut-off valve behind the Racor. 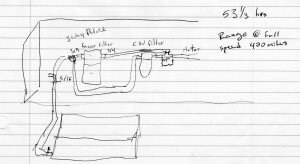 With the three-way valve, if the big filter gets clogged and we have to have the motor, I can simply turn the valve and the fuel will route through the CAV (now a backup), which may give us the time we need to get out of a tricky situation. Filter selection three-way valve. Grey thing at he bottom is the CAV filter. The fuel supply system is now in place and working well. The process from my initial idea (the little sketch) to final working install took about six separate trips up north and a ton of hours. On paper the idea was great, but when I had to put it together in the allotted space, adjustments had to be made. Once I finally got the whole thing working and was testing the valve bypass system, for some reason I was still smelling freshly spilled diesel. After a little investigation, I discovered a leaking fuel return line. This time, I decided to just replace the hose. Next up in Engine part 2: Winterizing Mistakes and Converting to Closed Cooling. More ocean-related jokes. 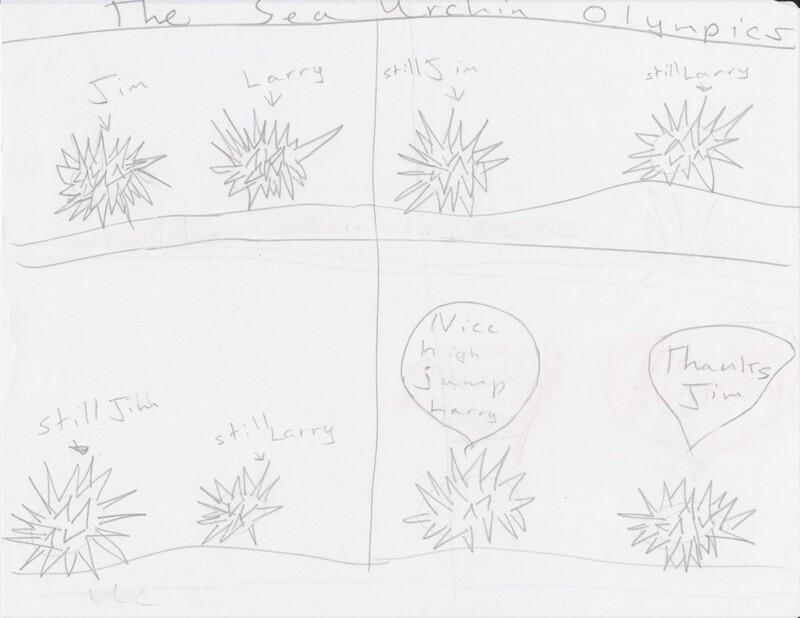 Pretty good sea urchin, considering she’s never seen one.